One of the fun things about guacamole is that there are so many ways to make it. The most basic guacamole contains very few ingredients: avocado, lemon juice, salt, and cilantro (which can be optional!). More involved guacamole recipes contain things like onions, tomatoes, spicy peppers, and more. Since I often throw my guacamole together with what is in the fridge, I surprise myself with new additions, and this week it was chopped kale to make kale guacamole. Unexpected, I know, but it stood in nicely for the cilantro I don't have at the moment. The deep green leaves were the perfect contrast to the spicy pepper, and I loved knowing that they added an extra layer of protein to the already healthy snack. We ate ours with tortilla chips, but you could also dip in some sliced peppers or squash! 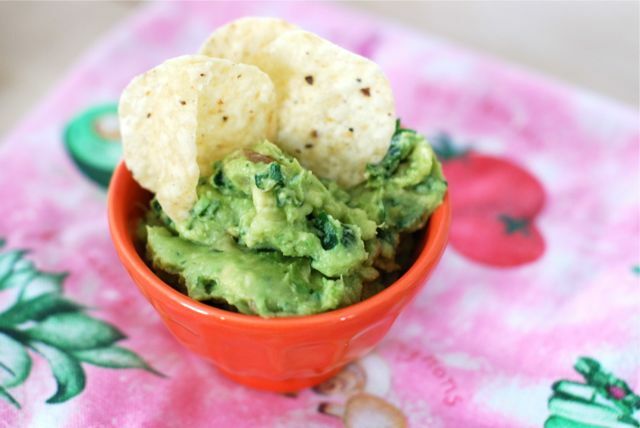 A delicious recipe for kale guacamole that I love to make at home! Step 1: Peel and scoop avocados into a large bowl. Mash with a fork and immediately add lime juice. Keep one avocado pit and set aside for later. Step 2: To the avocados add the tomato, onion, kale, jalapeno, and salt. Mix together and taste ingredients for saltiness. If it needs more salt add a dash or two and taste again. Step 3: Serve with fresh tortilla chips. If you make the guacamole ahead, nestle the saved pit in the dip to prevent the avocado from turning black. Cover dip tightly with plastic and keep in the fridge until ready to serve.